Posted on February 9, 2019 at 3:53 am. 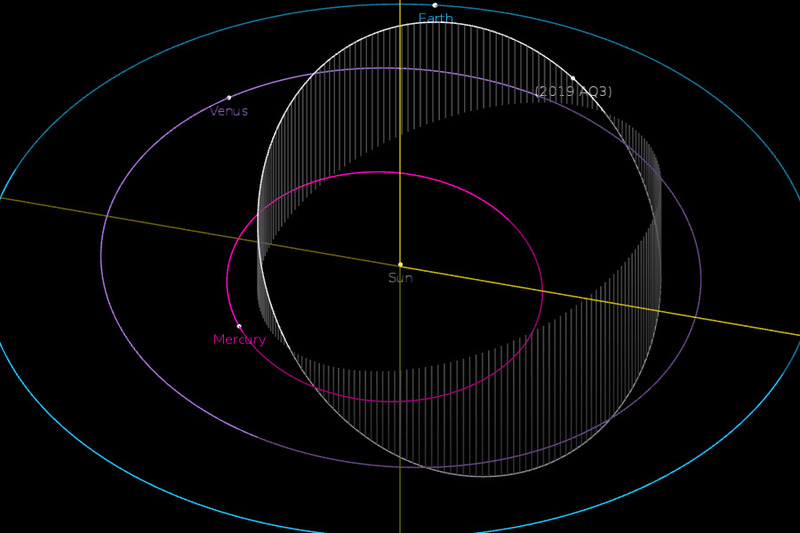 Astronomers have discovered an asteroid looping through the inner solar system on an exotic orbit. The unusual object is among the first asteroids ever found whose orbit is confined almost entirely within the orbit of Venus. The asteroid’s existence hints at potentially significant numbers of space rocks arcing unseen in uncharted regions nearer to the sun. Based on observations obtained with the Samuel Oschin Telescope 48-inch and the 60-inch Telescope at the Palomar Observatory as part of the Zwicky Transient Facility project. ZTF is supported by the National Science Foundation under Grant No. AST-1440341 and a collaboration including Caltech, IPAC, the Weizmann Institute for Science, the Oskar Klein Center at Stockholm University, the University of Maryland, the University of Washington, Deutsches Elektronen-Synchrotron and Humboldt University, Los Alamos National Laboratories, the TANGO Consortium of Taiwan, the University of Wisconsin at Milwaukee, and Lawrence Berkeley National Laboratories. Operations are conducted by COO, IPAC, and UW.